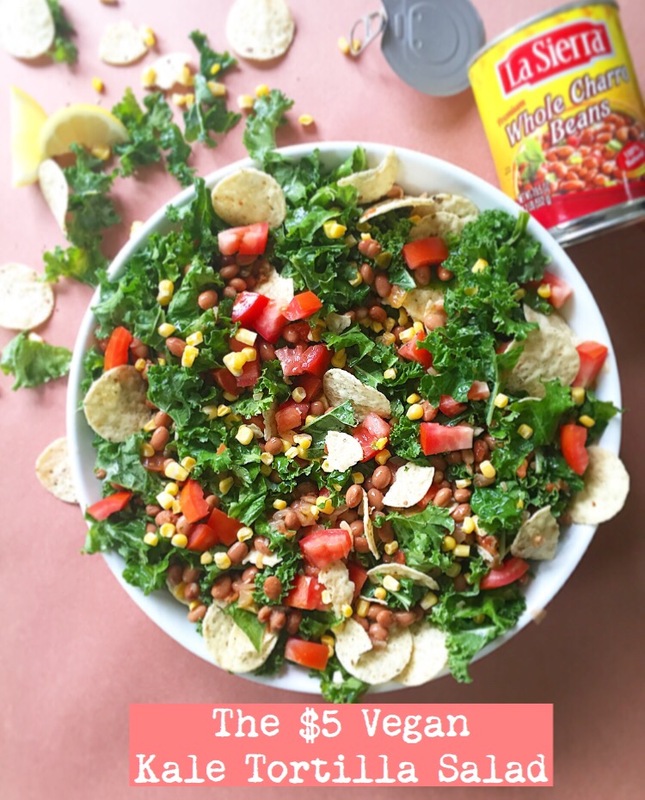 I’ve teamed up with a group of beautiful bloggers for Foodies Fighting Hunger, and attempted to make a meal for under $5, in recognition of the Hunger/Poverty issues in the U.S. This was in no way to prove that it was easy, in fact, it was the hardest recipe I’ve ever created but I did it and it’s delicious! I’ve learned that so many people in the world don’t have the privilege of feeding themselves everyday and that’s something I will never again take for granted. No, I’m not only talking about the homeless or the poor, I’m talking about the millions of people in this country who don’t have the means to buy themselves food. every. day. Can you even imagine? In California alone, there are 1,776,465 households with limited access to adequate food. In an effort to spread the message, I took on the daunting task of creating a meal for my family with ONLY $5 to spend, and it was even more difficult than I imagined. This recipe is not to prove that this is easy to do but to get the conversation started and get you to start appreciating the simple blessings of your life that you might have forgotten to be grateful for lately. Luckily for me this dish ended up being something really filling, delicious, full of nutrients, and actually crave-worthy, but for so many in this world, these are just mere luxuries. 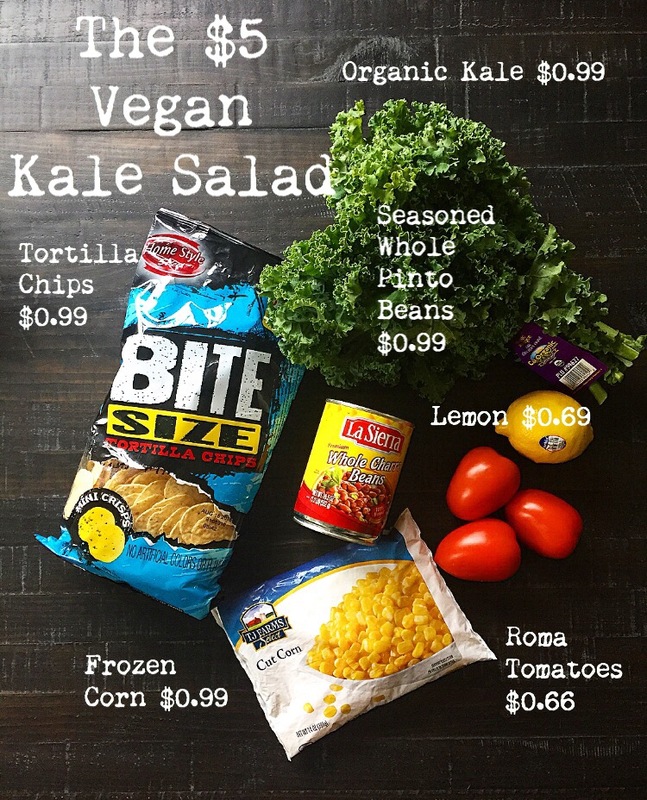 I ended spending $5.51 cents on the ingredients and shopped at The Dollar Store & Ralph’s Grocery Store. I did have some leftover chips, corn, and lemon that I could stretch for another meal later this week. I also opted to buy the seasoned beans because I felt they would add more flavor to the salad without having to buy any herbs or expensive seasonings. Surprisingly the healthiest thing in this salad happened to be an organic ingredient which I thought was just too fabulous to not mention. The salad was truly very tasty and kept well in the fridge for leftovers the next day. If this was the only thing you were going to eat I’d say it feeds 2 – 4 people. It has the 3 basic parts of a meal- protein, veggies, & carbs- so it was really very satisfying. I hope you enjoy making this for your family and sharing with them the truth about hunger in America. My intention is that you’ll begin a discussion about all your blessings and the daily gifts you encounter in your life that you might not realize are pure luxuries to someone else. Let’s at the very least begin to appreciate them more. Rinse and dry 1 bundle of kale. Tear in small pieces into a bowl and discard the stems. Squeeze juice of 1/2 lemon over the kale and massage well to soften. This will make it so much easier to chew. 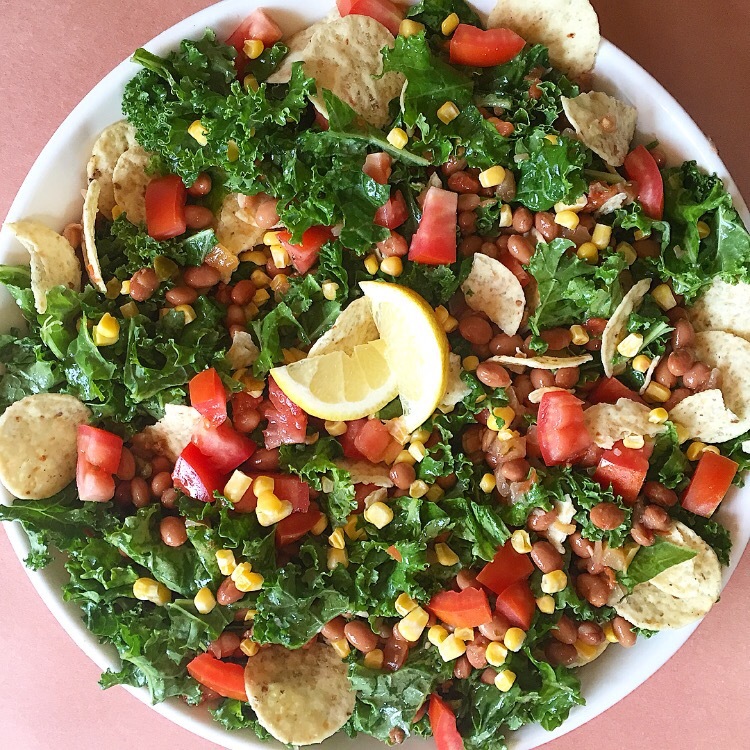 Chop 3 tomatoes and add on top of kale. Defrost corn and add half the bag on top of kale. 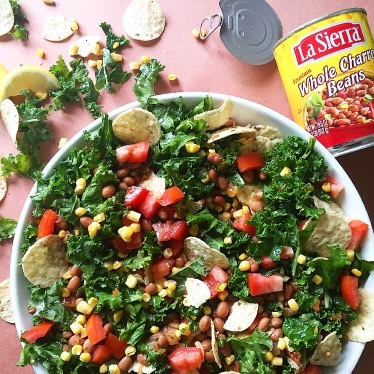 Drain the can of beans, do not rinse, add on top of kale. 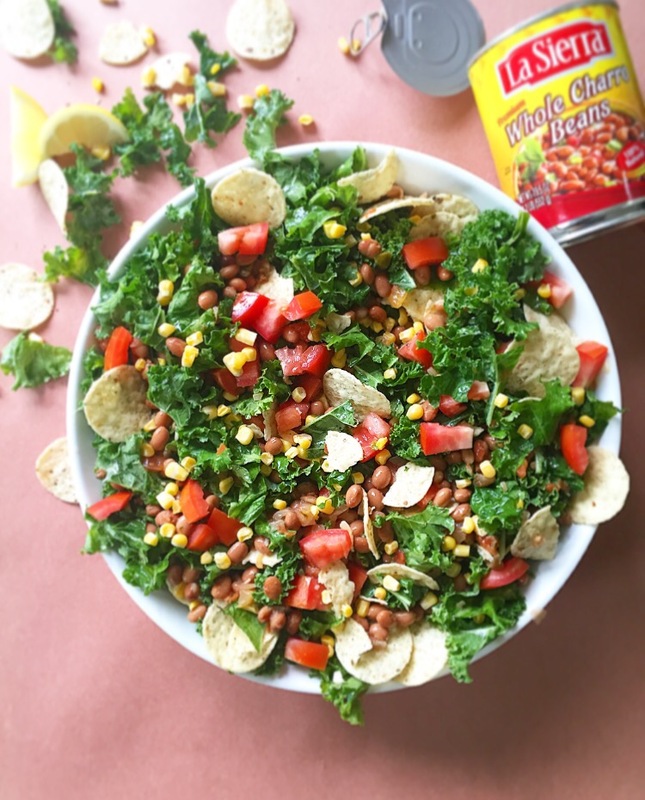 Crumble half the bag of tortilla chips directly onto the kale, leaving some big pieces. Mix everything well. Add salt & pepper. Think of 3 things you’re very grateful for. I have to thank Mazon for leading these efforts and providing us with information and hard facts of the poverty levels in this country. I also want to shout-out those beautiful foodies I mentioned whom all created unique and delicious recipes using just $5.00. I highly recommend you check them out and try some for yourself! Hunger By the Numbers: Click here for an Interactive Map to give you the full picture of this problem and how frighteningly close it is to you. Tell Congress to end hunger for military families now! MAZON: A Jewish Response to Hunger is a national nonprofit organization working to end hunger in the United States and Israel for all faiths and backgrounds. For more information, please visit mazon.org. NO compromises on this recipe, Paris. Great to meet you through Foodies Fighting Hunger! This looks wonderful. Totally making this for lunch this week!